FIVE members of the Fremantle Roosters Rugby League Club have helped WA secure its eighth straight Affiliated States Championships crown. The team went undefeated in its three matches against South Australia, the Northern Territory and Victoria, with SA the only team able to score points off the strong WA side. Roosters’ Bradley Gibson, Jarrod Thompson, James Aspden, Taiapa Graham and Delane Edwards all played their part across the three games, Graham and Edwards scoring tries against SA and NT respectively. 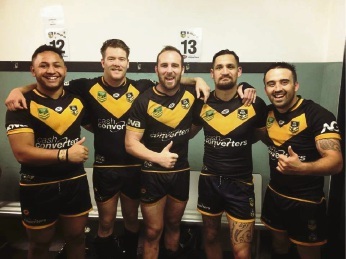 In recognition of their dominance across the competition, Thompson, Gibson and Edwards were selected to represent Australia in the National Combined Associate States open mens’ team that will take on England just before the Rugby League World Cup later this year. WA also took out the under-16 girls title.